“Slow but correct is better than fast but wrong”- A wise teacher! 7 years Elementary/Middle School Band and Orchestra Director at Charles A. Selzer School, Dumont, NJ. Dumont High School marching band staff., 3 years High School Band and Chorus Teacher at Pompton Lakes High School, Pompton Lake, NJ. Taught Instrumental and vocal music lessons, Band, Chorus, Music Appreciation, AP Music Theory, directed high school marching band and directed Spring musical productions., 4 years Elementary/Middle School Band Director at E.G. Hewitt Intermediate School and M.J. Ryerson Middle School, Ringwood, NJ. Lakeland High School marching band staff., 2 years Private woodwind instructor at the Morris Conservatory of Music, Boonton, NJ., 3 Years Elementary School Band Director at Littleton Elementary School, Parsippany, NJ. Parsippany High School marching band staff. Hi there! My name is Rich and I’m new to Music & Arts as a woodwind instructor. I am a tenured public school music teacher with 15 years of experience teaching instrumental music to elementary, middle school, and high school age students. 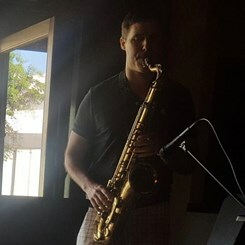 I specialize in teaching saxophone and clarinet but also have a great deal of experience teaching all Band instruments at the beginner level. I have studied under several world renowned saxophone pedagogues including Harvey Pittel, Albert Regni, and Allen Won. I’ve studied under several jazz saxophonists as well, David Bixler, Erik Lawrence, and Peter Furlan. I have a student-centered philosophy coupled with a systematic problem/solution approach. I have solutions to the problems that many students suffer from including: proper sound production, breath support and control, counting rhythms, correct embouchure formation, posture, building technical proficiency, intonation, and adequate application of music theory through performance. Students learn best by doing! Throughout my tenure as a public school instrumental teacher, I've noticed this one simple truth. Much like Einstein had said, "Life is like riding a bicycle. To keep your balance, you must keep moving," students need to be immersed in the process of playing in order for real learning to exist. I strongly believe in playing along with students in lessons. Students also need tangible goals that are achievable at various steps throughout their progress. I always push for more performance opportunities and can even arrange music for my students that they would not be able to find elsewhere.